W-1150: Scientists working under this project have developed several new common bean lines and varieties with biotic and abiotic stress resistance and enhanced nutrition and quality for the benefit of producers, consumers, and the environment. Effects of the bean virus. Issue: Dry beans, introduced by the Native Americans, have been grown in the United States for millennia. However, compared to corn, soybean, and wheat, the average national yield of dry bean is low (≈1,700 pounds per acre). 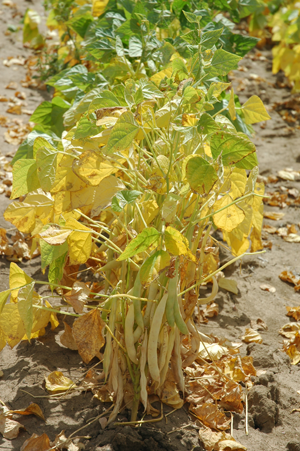 Several abiotic and biotic stresses can severely limit both dry and snap (vegetable form) bean production. Furthermore, several diseases can simultaneously reduce dry and snap bean yield and quality within and across different production regions, and yield losses can range from 10–90%, depending on the diseases involved. In order to remain competitive growers need to have access to varieties that are resistant to these stresses. Dry beans have been widely shown to have significant health benefits. In developing countries, beans are the main staple food; however, in developed countries they are underutilized. Health benefits from eating beans are numerous. Beans are low in fat and high in protein and provide calories, dietary fibers, vitamins, iron, potassium, calcium, zinc, phosphorus, and other essential nutrients. Several of the most severe chronic health problems (e.g., certain types of cancer, type 2 diabetes, and cardiovascular diseases) in the United States could be alleviated by eating more beans. Therefore, identification and promotion of the health benefits of dry beans are extremely important. Moreover, a greater emphasis must be placed on providing more diversified bio-fortified bean-based foods and convenience snacks that have improved nutritional value and consumer appeal. This multidisciplinary group of researchers and extension scientists has continued to focus on projects centered on improved resistance and nutritional value of the common bean. We have conducted extensive breeding and field and laboratory trials to accomplish these general objectives. As a result, a number of new lines and varieties have been made available to our stakeholders throughout the West and in other parts of the United States. Susceptible and resistant beans in a field trial. Several of the state breeding programs registered or released lines and varieties of beans with improved agronomic or end-use qualities. These new lines and varieties are available to breeding programs across the United States. As a result of this collaboration, more than 10 new cultivars and germplasm have been released in the last five years in several market classes, including pinto, navy, black, great northern, and kidney, among others. These cultivars are being used intensively by bean growers in different production regions across the United States. The California program discovered a source of resistance to halo blight race 6. Prior to this discovery, there was no available resistance to this pathogen, a serious disease of common bean. This discovery now makes it possible to systematically breed for resistance to this disease. Numerous microbial and other pests that affect beans have an important influence on production yields and on pesticide applications needed for their control. Thus, monitoring for these pests has important implications for growers, consumers, and environmental stewards. Timely reporting on soybean rust, as well as other pest and disease monitoring in the West, allowed pest management specialists to advise crop consultants and growers regarding disease status and threat. As a result, thousands of acres of legumes (e.g., 30,000 irrigated acres in eastern Colorado) were not sprayed needlessly with a preventive fungicide. This provided economic benefits ($1–1.5 million based on an applied fungicide cost of $20–25 per acre) to growers and reduced chemical exposure (15,000 pounds at 8 ounces per acre) to the environment and the food supply. Access to and use of these and other improved germplasm. Field and laboratory variety analysis. Survey for classical and new abiotic and biotic stresses. New molecular tools for varietal development.